We've bundled together some of our favorite products that greatly improve the day to day journey in your Jeep JK. From a better position while wheeling to the comfort of back seat passengers we've got some of the most sought after comfort upgrades all bundled into one package! M.O.R.E. 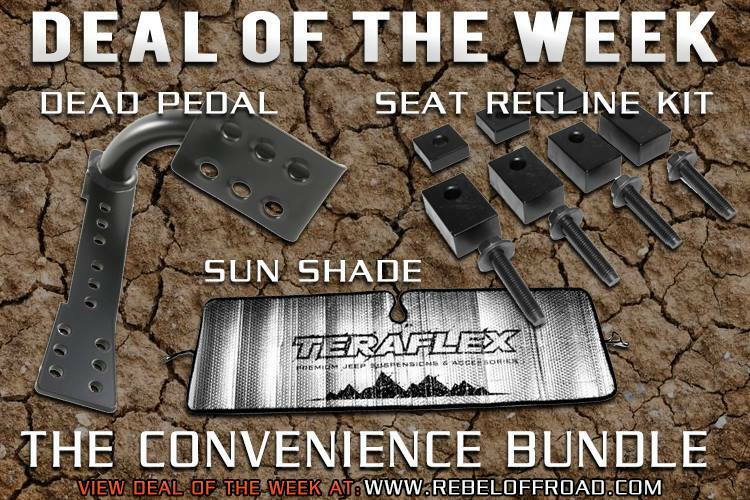 has a new product for enhancing your comfort level while driving your Jeep JK! This new, three way adjustable, easy bolt in JK dead pedal helps with leg fatigue that many of us get while driving when you do not have a place to support your foot, or help brace yourself while wheeling. The Jeep JK dead pedal bolts into existing holes no drilling required and comes powder coated black. The dead pedals will work with an automatic transmission for the driver and passenger side, or with a manual transmissions on the passenger side only. Reduce interior temperatures with the attractive TeraFlex JK Windshield Sun Shade. The thick double layer insulation blocks UV rays that can damage the dashboard and interior pieces. Folds easily and stays organized with elastic straps. Do your passengers complain about the rear seat comfort and or sitting too upright in your Jeep JK 4 door? Of course they do, its not comfortable at all. Well here is an innovative solution to a common complaint, the Innovative JK Products Rear Seat Recline Kit. This kit will allow you to gain approximately 2.5 inches of rear seat recline, measured at headrest. It does not sound like a lot, but it makes a world of difference. Some have even indicated their family friends are once again willing to ride in the back, in comfort, after installation of this kit.